Suleiman the Magnificent (Suleiman I) was Sultan of the Ottoman Empire. He was the 10th and the longest-reigning Sultan of the Empire (1520-1566). During his reign, he conquered Rhodes island, Belgrade, Jerusalem, Austria, Hungary and North Africa and the Empire dominated the seas from the Mediterranean to the Red Sea and through the Persian Gulf. He was also a poet and a goldsmith and he led the Ottoman Empire to its artistic development. Sultan Süleyman II, der Prächtige? La Moschea di Solimano il Magnifico (Süleymaniye camii) ad Istanbul, vista attraverso il Corno d'oro. No machine-readable author provided. G.dallorto assumed (based on copyright claims). Suleiman the Magnificent was a famous Sultan of the Ottoman Empire, who was born on November 6, 1494. As a person born on this date, Suleiman the Magnificent is listed in our database as the 6th most popular celebrity for the day (November 6). People born on November 6 fall under the Zodiac sign of Scorpio, the Scorpion. 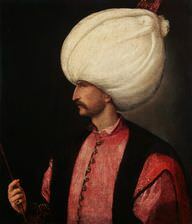 Suleiman the Magnificent is the 103rd most popular Scorpio. In general, Suleiman the Magnificent ranks as the 1219th most popular famous person of all time. “The Famous Birthdays” catalogs over 25,000 famous people, everyone from actors to singers to scientists to serial killers and more. If you're curious to see who was born on your birthday, you can use our database to find out who, what, where, when and why. You can search by birthday, birthplace, claim to fame or any other information by typing in the search box, or simply browse our site by selecting the month, the day, the horoscope, or any other clickable option.